Much as Apple and Amazon would be thrilled if you populated your iTunes library with nothing but tracks purchased from the iTunes Store and Amazon MP3, there’s a very good chance that you already have a load of music just waiting to make its way to your computer and iOS device—your CD library. Here are the steps for turning your discs into digital files. By default, iTunes will import (or rip) CD tracks using the AAC encoder at 256 kbps. This is a “lossy” compression format (meaning iTunes makes your tracks consume less space by removing audio data that you shouldn’t be able to hear). However, it’s also a lossy compression format set at a high bit rate, which means it should be extremely difficult (if not impossible) to detect any difference between the original and ripped versions. If you’d like to change the encoding settings—either to save more space by choosing a smaller bit rate such as 128 kbps or to get a higher quality file by choosing a lossless encoder such as Apple Lossless or AIFF—choose Preferences from the iTunes menu and click the General tab. When you select either AAC Encoder or MP3 Encoder in the Import Using pop-up menu you can choose a different bit rate in the Setting pop-up menu below. 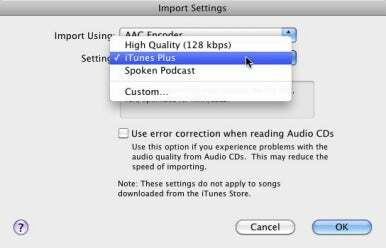 When you choose AAC Encoder your preset choices are High Quality (128 kbps), iTunes Plus (256 kbps), or Spoken Podcast (64 kbps). Choose MP3 Encoder and your preset choices are Good Quality (128 kbps), High Quality (160 kbps), and Higher Quality (192 kbps). For each encoder you also have a Custom option. Select it and a new window opens where you can choose from among a variety of bit rates. Again, the higher the bit rate, the better the audio quality and the bigger the file. You can also view iTunes’ Import Settings by selecting the CD in iTunes’ Source list and clicking the Import Settings button at the bottom-right of the iTunes window. Additionally, with Doug Adams’ free Rip A Few My Way AppleScript installed, you can invoke the script from iTunes’ AppleScript menu and choose the encoder you’d like to use for selected CD tracks. Insert a music CD into your Mac’s media drive. By default, iTunes will launch, the CD’s name will appear in iTunes’ Source list and be selected, and the CD’s track names will appear in iTunes’ main window. If the CD’s track names don’t appear it either means that your computer isn’t able to communicate via the Internet (which is how iTunes obtains album, artist, and track names) or the CD is one that’s not recognized by iTunes (a “mix tape” CD a friend has created, for example). For those CDs that don’t have track names automatically added, you can click on individual titles and add names manually. Would you like to import the CD “name of CD” into your iTunes library? Click Yes to import all the individual tracks on the CD or No if you’d prefer to not import the tracks at all (or do it at another time). If you click No and later wish to import the tracks from the CD, select the CD in iTunes’ Source list and at the bottom-right of the iTunes window click on the Import CD entry. iTunes will begin ripping the CD and adding the tracks to the iTunes library. If you’d like iTunes to rip just selected tracks, uncheck the tracks that you don’t want to rip. There may be times when you want to combine multiple tracks into a single track. For example, if you have an audiobook CD that includes lots of short files that you’d like to play as a single larger file, or a series of live songs that segue smoothly and you’d like to keep together. To combine tracks, simply select the files you want to join and choose Join from iTunes’ Advanced menu. iTunes will place a bracket next to the tracks that will be joined when you click Import CD.